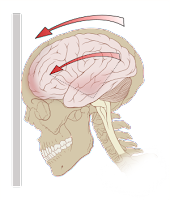 alteration in the mental status that may or may not be associated with loss of consciousness. 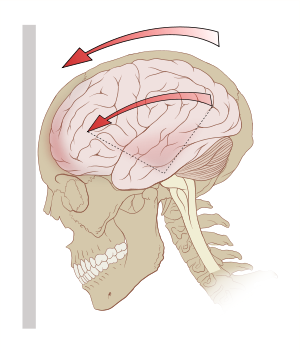 Concussion is a mild form of Traumatic brain injury (TBI). The levels of glutamate(an excitatory neurotransmitter) increase just after a concussion and the brain enters a hyperglycolytic (increased rate of glycolysis) & hypermetabolic state. -In mild cases: the patient may vomit once or twice showing no detectable physical signs.After few minutes of mental confusion, he may recover completely. -Complete recovery → In the majority of cases. -Incomplete recovery → The patient regains consciousness,but develops a state of post concussion (P.C) during which he is drowsy, irritable with headache and vomiting. Few days later he may recover completely or suffer from retrograde amnesia,impairment of memory perception and post-traumatic automatism. -Brain compression → The patient may pass directly to compression or after a period of lucid interval.